Stereo Bluetooth headsets provide wireless functionality for listening to music in high-quality stereo, as well as the ability to answer calls with a built-in microphone. 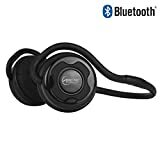 Pair these with your cell phone and/or your bluetooth-capable mp3 player, and enjoy 10 to 20 hours of operation on each charge. Where these three headsets primarily differ is in form factor. The LG Tone HBS-700 has a lightweight around-the-collar design with earbuds that magnetically snap into place when not in use. The Arctic Sound P311’s have a behind-the-ear design with supra-aural open-back headphones, and are foldable for easy carrying when not in use. The Samsung Modus HM3500 has the smallest footprint and can be converted to a conventional in-ear mono headset.